In the eighteenth century, members of the French Court amused themselves splendidly: "The day before yesterday there was a great masque in Versailles". Thus a letter written in 1700: "The Duchess of Burgundy, in the guise of a village bride, came with her retinue of ladies in waiting, who were all masked, as she was, and whose hair was adorned with many flowers. This made a gloriously cheerful effect.... Eight days before there was another pretty harlequinade at Marly. The loveliest were the Savoyardes with their pedlar's bundles on their backs, which they opened. Two little harlequins and two Columbines popped out, little girls and boys, who danced beautifully." Even King Louis XV, then only eleven years old, took part in fetes galantes, elegant entertainments, in 1721. He mimed a ballet dancer in a ballet entitled The Elements. Not only did the nobility love dressing up and playing theatre. Like many of his contemporaries, painter Jean-Antoine Watteau did, too. He was particularly taken with the characters in Italian improvised comedy, commedia dell'arte. They brought welcome diversion and pleasure to the poor as well. Commedia dell'arte originated around 1550 in Lombardy, evolving as street theatre in which improvised pieces based on stock situations were performed by troupes of specially trained actors. All that was prearranged were synopses of the plot and the sequence of scenes. Consisting mainly of clowning and jokes, the dialogue was entirely improvised. Although a couple in love belonged to the stock repertoire, the other characters were burlesque types, instantly recognisable because they always appeared in the same masks and costumes: Pantalone — an elderly Venetian merchant, the doctor, a scholar of Bologna and Arlecchino, and his crafty man-servant, whose awkward and melancholy side soon became personified as a separate character called Pedrolino. After commedia dell'arte had become established in France at courts, fairs and in the streets, Pedrolino changed into a pitiable fool, who might be called either Pierrot or Gilles. This character represented the rejected lover, who was always sad. He was characterised by a distinctive white, wide-sleeved costume, a white mask and a wide white beret. 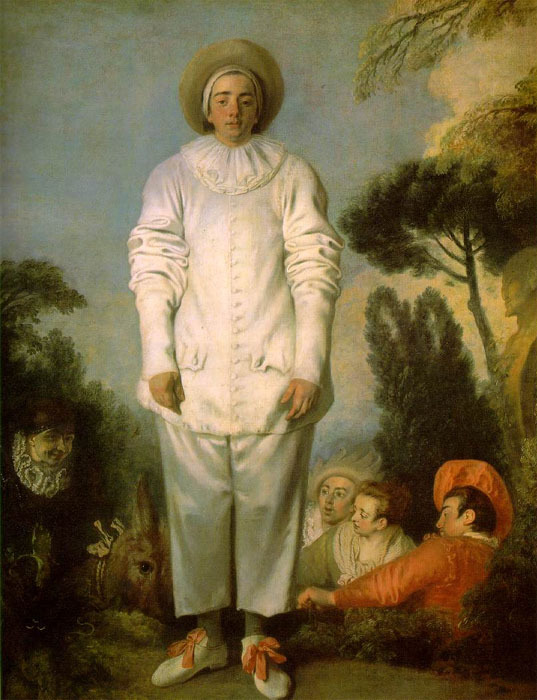 Did Watteau paint his Gilles as a portrait of an actor famous for playing the part of Gilles or Pierrot? Was this life-sized painting possibly hung in front of a cafe, or theatre in which the actor in question may have appeared in the role? Be that as it may, the melancholy clown, mocked, ridiculed and despised for his asinine helplessness, was a favourite with Watteau for the sole reason that he was so wretchedly sad. The mournful clown appears several times in his work. Is this a biographical clue? The painter knew all too well what it was like to have only himself for company. His final years were marred by disease and melancholy before he died at thirty-seven of tuberculosis.